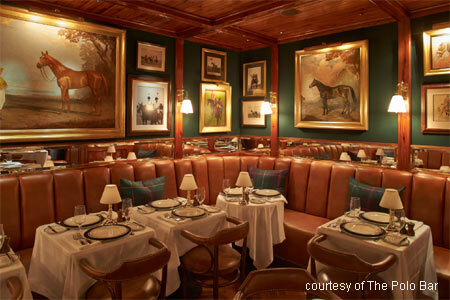 Be famous or a serious mover-and-shaker to gain entry to Ralph Lauren's popular equine-themed restaurant. : This review might be the closest you come to experiencing Ralph Lauren’s The Polo Bar. Notoriously impossible to get into, the restaurant comprises a bi-level space with a long bar (with overpriced cocktails) on the ground level and a dining room, clad in all manner of horse images, down below. Nibble on retro bar snacks like Pigs in a Blanket or shrimp cocktail. 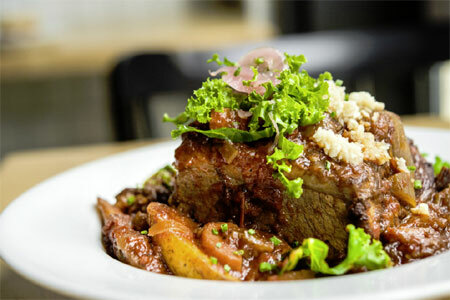 Glorified comfort food fills the menu, with a better-than-average corned beef sandwich, a towering burger, and an underwhelming kale Caesar salad. Spinach and ricotta agnolotti arrive in a Parmesan truffle sauce. Roast chicken is splashed with unctuous gravy and paired with creamy mashed potatoes, while pan-seared salmon offers just the right hint of Meyer lemon. There's a 22-ounce bone-in rib-eye served with fries, too. Desserts are worth a glance, particularly the chocolate and peanut butter tart. Cocktails are twists on classics, like a margarita sweetened with agave. The wine list, predictably, is priced for the one percent. But then again, if you dine at The Polo Bar you’re likely doing well enough to be able to order a bottle of Château Cheval Blanc without giving it much thought.